In the range of the cheap price, we can already get mobile phone with the rather complete. not only Chinese vendor of origin, the phone is actually branded also opted to have this category. One of which Motorola W396. At the same price range, there HiTech G32. Display features that this phone was taken not far different from the W396. However, the matter of the quality of course will differ greatly. To find out how strong ability brought them, I'll dissect the second phone. So that you do not include any budget in the beginning of the year. Both apply the concept of different mobile phone. 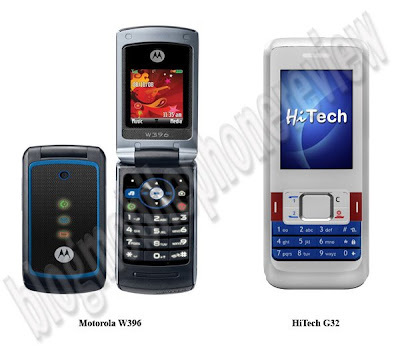 Motorola W396 with body fold (Clamshell), while G32 faithful HiTech with candybar design. Differences in hours of each brand, seen from the material used. W396 better than the G32 that seemed "cheap". This is different between the mobile phone branded with the mass production of China. As a senior that has its draft clamshell, W396 also uses LED indicators to indicate that some functions. Phone entry, miss call, SMS and the process of re-charging the battery. In the keypad, even with the surface of the W396 in a few large able to bring comfort typing messages. Compare with the G32 meeting, and that seemed small, the action type SMS is also difficult. Because, the key material with the plastic hard enough in the G32 and less responsive. Consistent with its ability to bring technology Dual On, the keypad structure HiTech G32 insert the key to access two SIM card directly. Its position on the left side of the D-pad, close to the left soft key. Take part in the. Here, the interface can be spelled both not far different. Model matrik grid structure so the main menu options. Standard, with simple icons. Interestingly, in the menu property of Motorola W396 can be reset according to taste. In fact, the appearance can be set to the frame mode. To display, HiTech G32 better with use transflektif LCD resolution with 262,144 colors. Meanwhile, Motorola owned only 65,536 colors. However, the maximum brightness in the W396 can slightly increase the clarity this interface. This sector won by HiTech G32, through the dual SIM card slots that you can plug in two cards from different operators, and can be turned on at the same time. Unfortunately for the two mobile phone capability, such as fixed can not be the maximum. For example for the purpose of browsing the internet, the card can still be used in the slot 1 or SIM card master. For low end mobile phone class, this one facility shall provide, at least have a music player or FM radio. And the W396 and G32, all akomodasi well. To track the player, the phone has been using a special player with a standard interface. Music formats are supported also balanced, namely MP3. Audio problem, the average Chinese mobile phone that can give voice loud enough, so HiTech G32. However, with the presence of specific loudspeaker Motorola W396 also does not want to lose. The song that came out of this loudspeaker, a voice can be loud but still clear and well heard. Second form of entertainment to the FM radio. Should enable them to use hands-free with the tip of the connector standard respectively. W396 with a 2.5 mm jack, while the G32 with special connectors. Another property of the benefits of radio features Motorola, the W396 has the capability of the radio broadcast recording, the recording files will be directly in the settings as the alarm tone. Interestingly again, you can also transmit radio waves that are broadcast to listen to via SMS and MMS. Smart. Switch to the visual, there is no special in this category. Both phones include a camera is only VGA, with the ability to record a maximum image resolution of 480x640 pixels. By setting the camera up to snap the W396 appear brighter and more clear than the G32, which still seems blurry. Unfortunately, Motorola camera is not able to record a moving image (video) as belonging to G32. Both phones also add the features of the rather comprehensive daily. There are Calendar, Calculator, Alarm and more. However, the property of HiTech little more sophisticated by adding more security features important data phone called "Firewall." You can protect Phonebook, call logs and message with a special password. Fair useful for those who like to keep secret. For entry-level mobile phone that has the musical and multimedia, memory width so key factor. Unfortunately, for both internal only provide a small space. W396, for example, provide less than 5 MB. HiTech worse, internal only 505 kb. Luckily, they both provide a microSD card slot as an alternative. In the sales package, Motorola W396 provides a free 2 GB. Meanwhile, HiTech G32 of only 512 MB. Connection problems, HiTech G32 juaranya. In addition to the data cable, this phone has also been using the Bluetooth chip. Compare to Motorola, which only set up miniUSB data cable. However, the second mobile phone can also be mass storage and modem PC internet. One again, the ability roaming the virtual world second mobile phone is also balanced. Browser using the WAP 2.0, which can display XHTML pages with both. W386 actual battery capacity is lower than the G32, which is 940 mAh 1000 mAh appeal. However, the power management system in both the Motorola was able to give a longer durability. While the complexity feature lavish G32 makes the energy in the power supply is needed. Once in the charging, the battery standby W396 can be up to 3 days. While the G32 battery can only survive as long as 1.5 days. You want to appear trendy Motorola W396 can choose, in addition to cheap prices, features that brought sizable complete. Start from the camera to the MP3 player. However, you have two SIM cards, and both may want to try HiTech G32. Moreover, the price is also not much different. In fact, you will get some other productive features that are not owned W396. But, the design that seemed indifferent to its brand and the world that the withdrawal Motorola, should also be considered.